As this post goes live, over 250 restaurants across Los Angeles are gearing up for dineLA Restaurant Week, which is taking place in the summer for the first time, from July 16-27, 2012. This inaugural Summer Restaurant Week is also the first time the foodie fortnight is running through the weekend. The special prix fixe lunch and dinner menus encourage diners to try new restaurants and explore cuisines across the city, but it’s also a great way to see what’s happening with favorites. 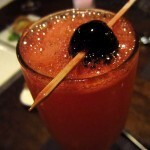 Case in point is one of my go-to spots and popular Restaurant Week participant, Bar | Kitchen. Located in the lobby level of the O Hotel in downtown LA, Bar | Kitchen debuted its Summer Menu earlier this month, featuring new dishes from Executive Chef Vahan Tokmadjian and drinks created by the B|K crew. 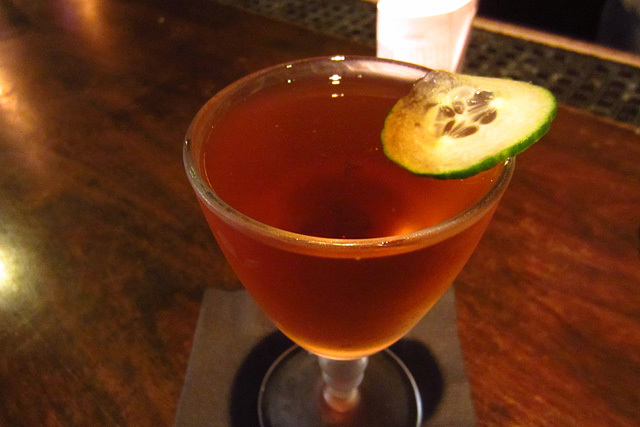 On a recent visit I started with one of the Staff Selections, the Chin Up: Beefeater Gin, Cynar, Dolin Dry and cucumber. The Sam Ross creation never fails to wake up the palate, a wonderful cocktail that starts bright and dry, then heads into the uniquely bittersweet signature of the Cynar. 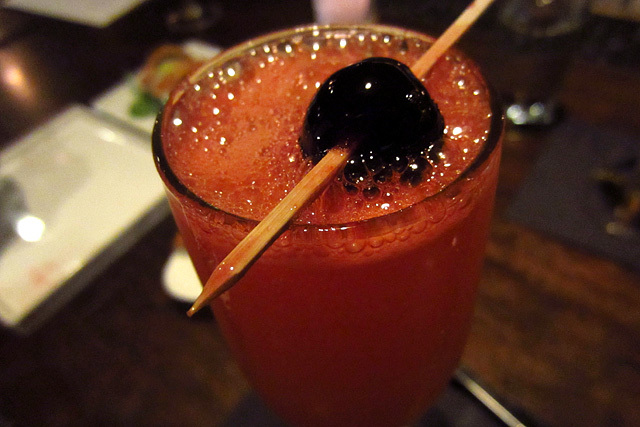 My friend opted for one of the new Summer Menu drinks ($11), Daniel Zacharczuk‘s Ever-Present: sparkling wine, Cocchi Americano, Campari, Demerara, lemon and cherry. Bubbles and bitters, you can’t ask for a better start to a summer evening. Bar | Kitchen has one of the best Happy Hour menus in town, and I made sure to place a few orders of Savvy Eats (a steal at $5 each) before the 7pm cutoff. 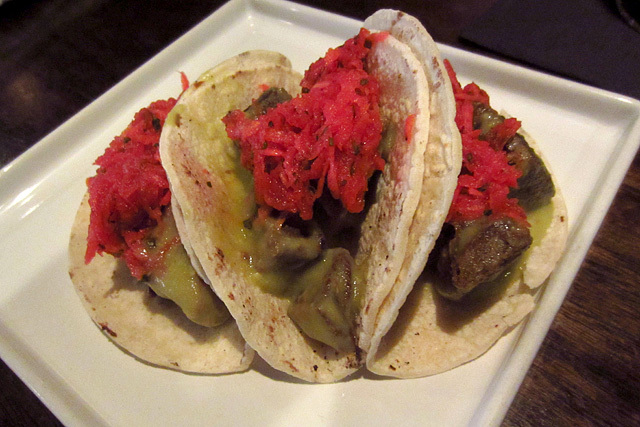 The Beef Tongue Tacos with salsa verde and radish relish were a good start, with the relish providing a sharp, tangy bite. 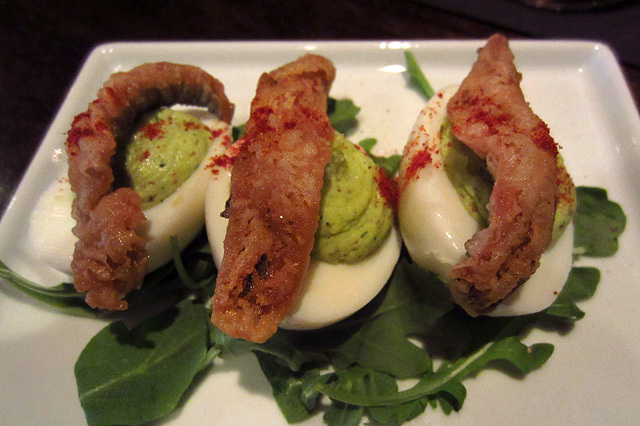 Deviled Eggs with mustard, herbs and crispy white anchovies. For round two I went with another chalkboard special, the F. Scott Buck. 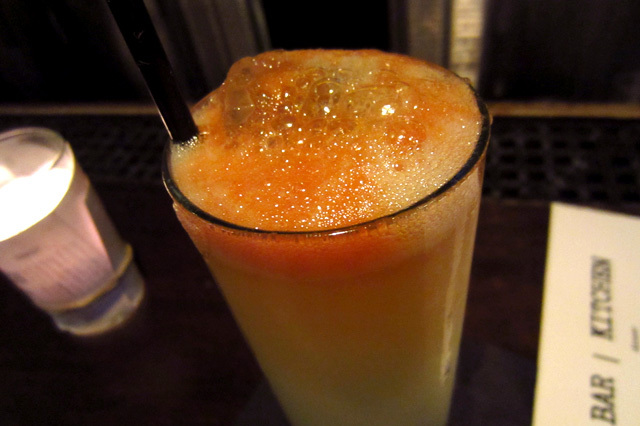 Ricky Yarnall’s take on Dale DeGroff’s Fitzgerald cocktail is made with Beefeater Gin, lemon, ginger, soda and Angostura bitters. Knowing Yarnall’s fondness for Ango, I’m guessing his specs have a bit more than the two dashes called for in King Cocktail’s original recipe. 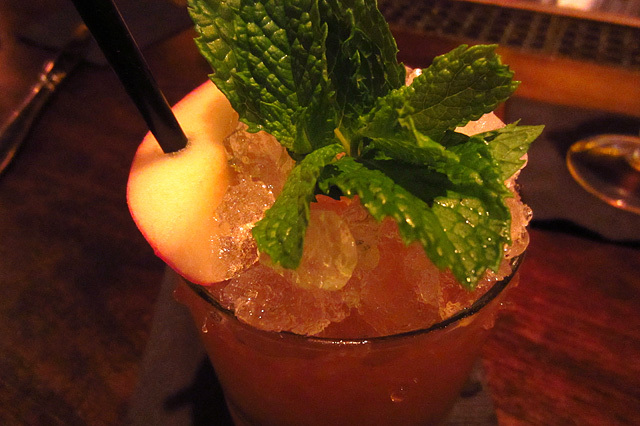 Gully H. Cobbler: sherry, gentian liqueur, lemon, cinnamon and peaches. 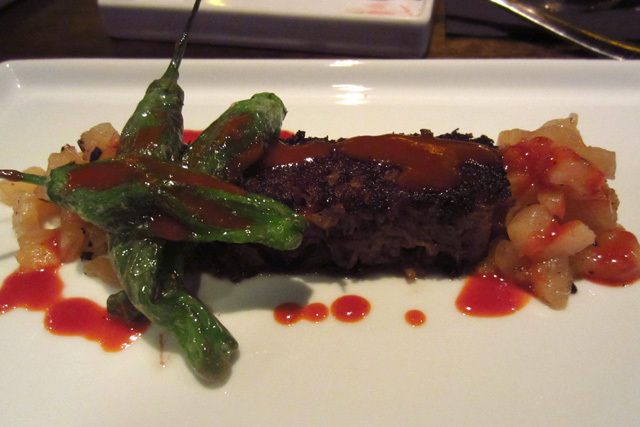 From the Dinner Menu, a standout Small Eats dish was the Crispy Berkshire Pork Cheek Terrine ($12), served with grilled pineapple, shishito peppers and Korean chili sauce. 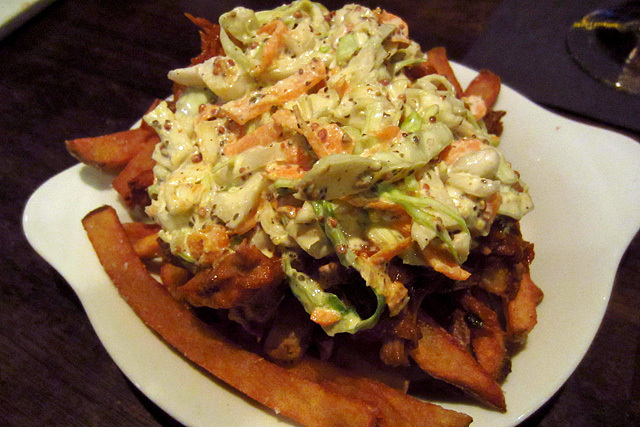 As with the fries, every bite yields a different mix of flavors and textures, with the added heat of the blistered peppers and chili sauce on the finish. 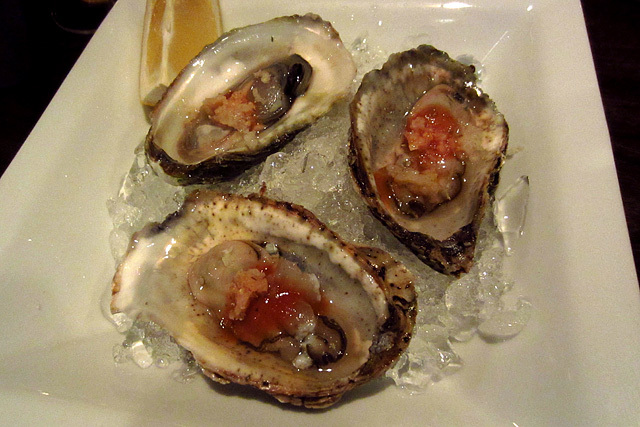 Another Small Eats item was so nice we had to order it twice: Market Oysters ($8), served with Bloody Mary vinaigrette and freshly-grated horseradish. We had learned our lessons well from Johnnie Mundell and did oyster luges with The Bowmore 10-year, shooting a bit of the whisky from the shell with the oyster liquor. Finally, to pair with a dessert selection of Lemon Tart with macerated blueberries and candied pine nuts ($8), the Pirate Ric: coconut-infused cachaca, lime, demerara, pineapple and meringue. 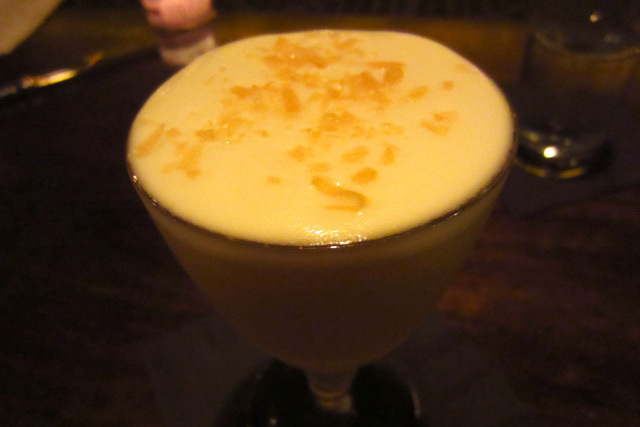 Sous chef Ric Sic had made numerous requests for a Piña Colada, and Yarnall’s version is sure to be a favorite. Sipping the tropics in a glass was the perfect way to end a first taste of the Bar | Kitchen Summer Menu, with several more seasonal drinks, new Staff Selections, and Tokmadjian’s Big Eats dishes to look forward to in the weeks ahead.